The area from the Rolls to Cottonwood Camp loads up with dozens of RVs on spring weekends. Most are out with their atvs or cycles during the day and soaking up the evenings RV style. Horseback riding is fairly popular around Cottonwood Camp. Hiking on the other hand doesn't seem to be the sport of choice. Nevertheless in my past three outings I've had friendly encounters including offers for rides to food & water. 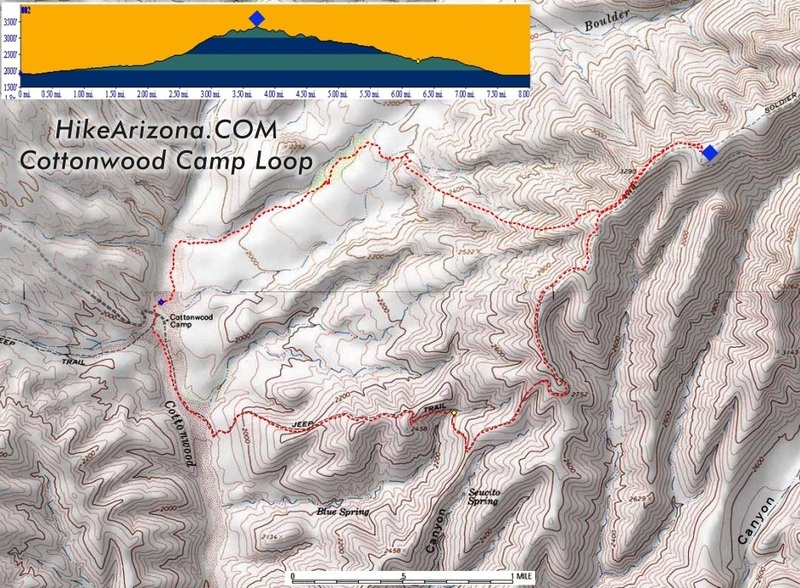 This hike heads up Boulder Creek then jumps on the Soldier Camp ridge and back down to Cottonwood Camp. 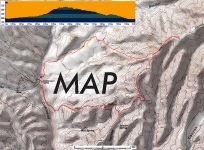 Check out the map and follow clockwise from Cottonwood Camp. Start off on the left/north side of the corals. Simply jump the fence and into the grassy meadow. Hopefully cairns will lead you on route, if not study the map. This isn't really the "Lower Soldier Camp Trail". I zig zagged the area trying to find a trailhead without success. In addition I zig zagged the area on route a bit. From what I can figure out there are three routes going up and away from Cottonwood Camp. The route I choose being the middle. The right/south route is an old jeep road, which is the designated trail. However I recommend following the map as it's much more scenic. The hike up is alongside the vicinity of Boulder Creek. It was much better than expected with stretches resembling a desert oasis. The last thing I was expecting was shade but there was in a few sections. Which was most appreciated on a record scorching March day. Jeans are almost in order for the prickly grasses. February is probably the ideal month to hike while the grasses are green and soft. Autumn would likely be an itchy trek. Wildlife felt close, though hard to see through the thick foliage. Butterflies glided about in several varieties. Quail tiptoed about prior to bolting off. When you come to an intersection take a right. It may be difficult to notice the intersection. Generally you have been hiking in one direction. If you take a hard left then you need to backtrack. The right is less distinctive and somewhat overgrown. It takes you immediately over a small ridge. Where you can see where you need to go. Dip through a wash and jump on the old jeep trail heading up. Since the area is now a wilderness, motorized access has been cut off. It's now called the "Lower Soldier Camp Trail". It must have been one hell of a ride because it's very steep in sections. Hike up the ridge. The 900-foot elevation gain might leave you cursing with one false sense of being over before it's over. Just keep pushing and eventually it narrows up before reaching FS 401. As of this writing there was no trail signage but a fiberglass flex stake marked the junction. Take a left and follow FS 401 up a half-mile to the Soldier Camp Trailhead. I didn't notice any signage for a trailhead here either. It's a wonderful slopped meadow with great views all around. If hiking on a forest road turns your stomach then don't bother but the views are top notch I tell you. Follow FS 401 back down to your vehicle.